Transportable Switchroom with underfloor inter cabling and HVAC ducting installed under computer floor. 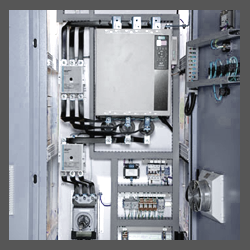 Mayfield provide the option of a custom-built switchboards, tailored to specifications, or a modular 'off the shelf' switchboard. 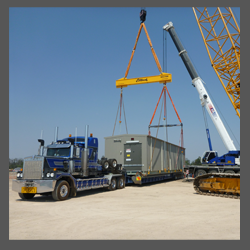 Mayfield is a specialist engineering company with Australia's most trusted name in design, manufacturing, installation and commissioning of transportable switchrooms and switchboard solutions. Once the design stage is completed Mayfield locks in a delivery schedule to meet or exceed the client's completion dates. 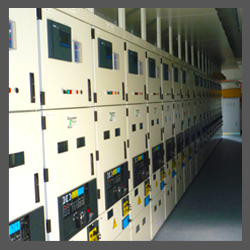 We can add value to your project by combining the switchboards and switchrooms into a complete modular solution. Fully engineered base frames, wall frames and roof structures. Very low movement tolerance is built into the base frame at around +-1%. Clients are invited to be part of FAT testing before leaving the manufacturing yard. 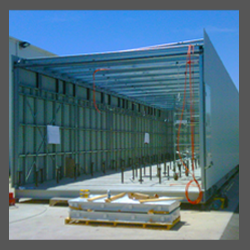 Mayfield supply office facilities for Engineers and client to set up on-site to oversee the project if required. Includes fully quality assured processes, with on-site architects to oversee the designs and premium quality products used as standard. Fully on-site design team to oversee all designs comply with the Australian standards. Including fully engineered Lifting points that are with NDT certificates as standard.